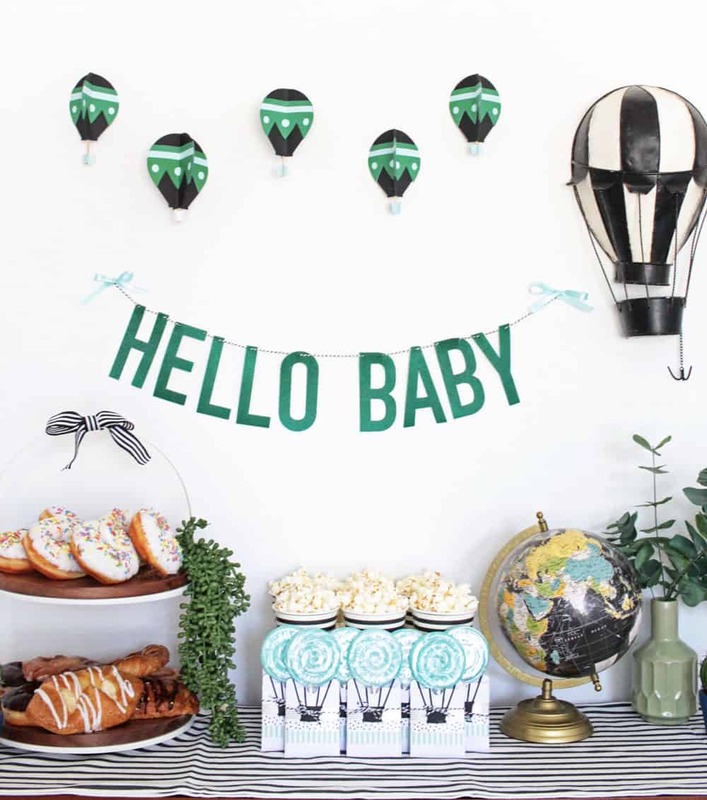 If you are looking for a unique baby shower theme, you can’t go wrong with a Hot Air Balloon baby shower! Any mom-to-be will love this boy baby shower with fun DIY decorations and favors! Bringing a new baby into the world is so exciting, who doesn’t love to celebrate a new babe? We have such an an occasion coming up for my friend. 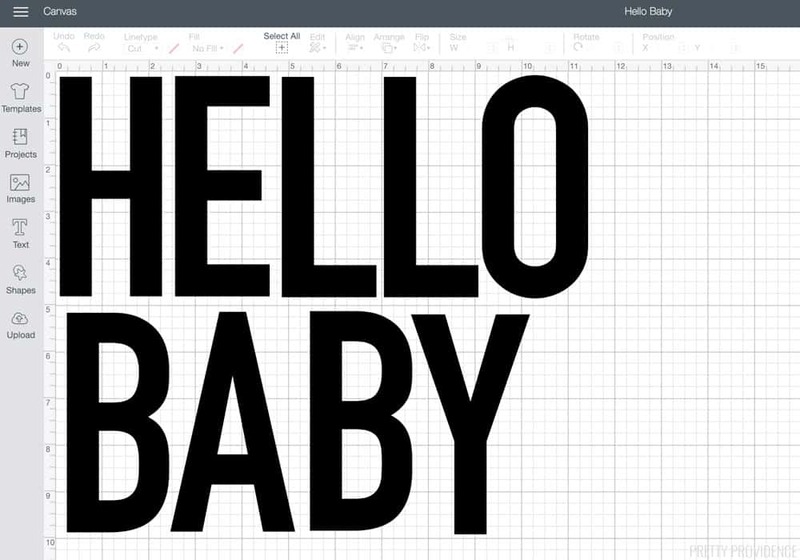 While brainstorming, I came up with some reeeally fun boy baby shower themes and baby boy shower decorations. 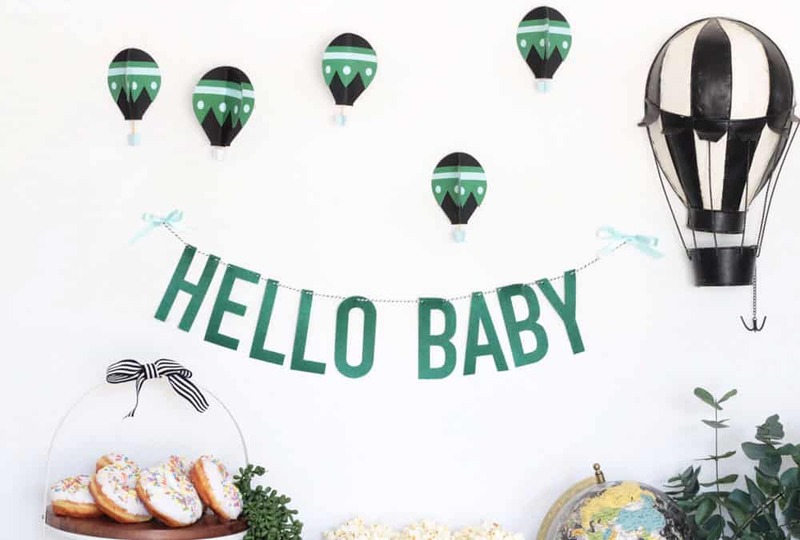 I decided that A Hot Air Balloon baby shower would be awesome. We have a vintage hot air balloon decoration in my girls’ room and that served as the inspiration. I borrowed it for the party, and made all of the other decorations with my Cricut Maker. 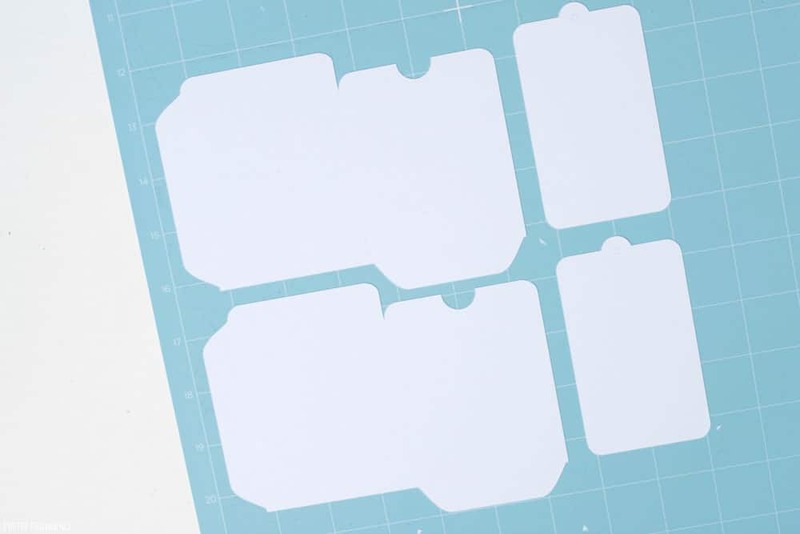 I used mainly card stock and felt to make them, super inexpensive materials! 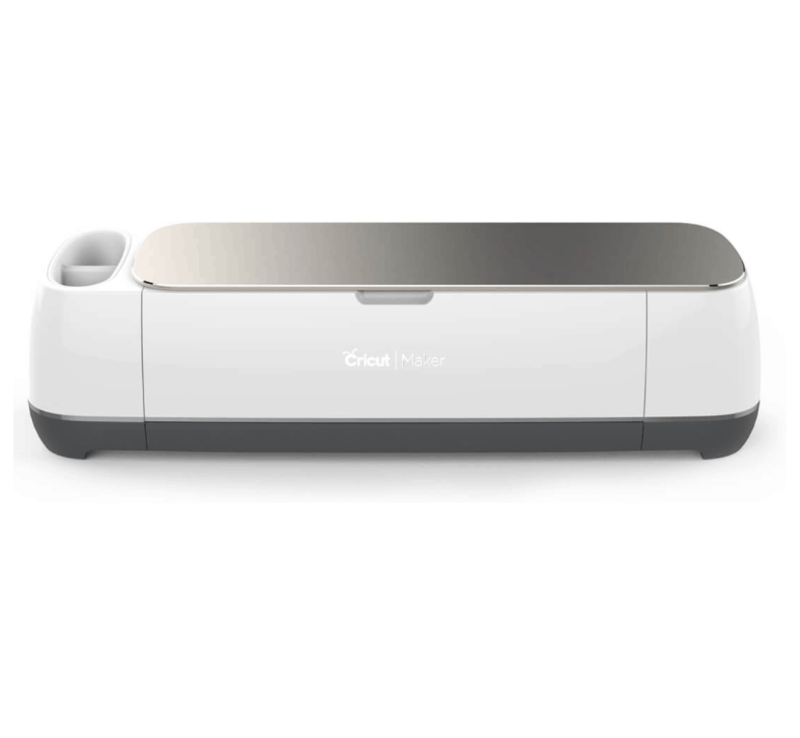 If you use a Cricut, Cricut Access subscription is a no-brainer. There are so many fun projects and images that you can use if you’re subscribed. 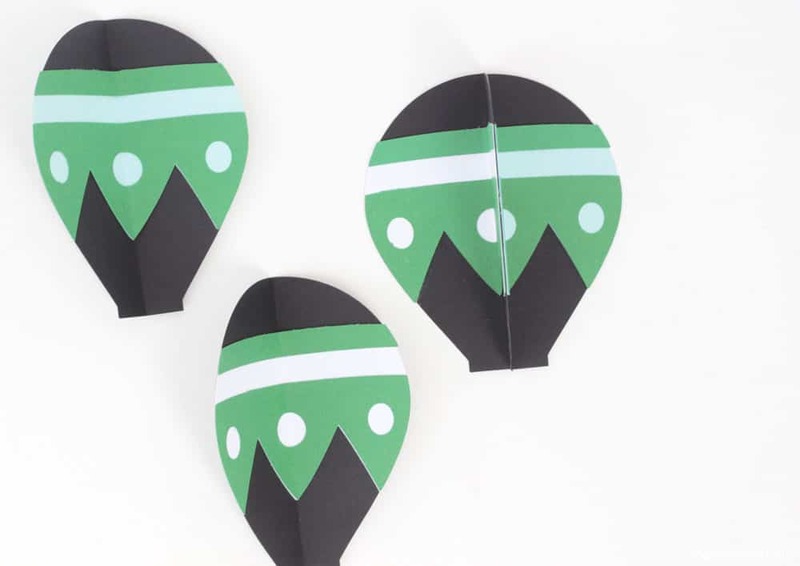 The 3D hot air balloon decorations were actually a project I found in Cricut Design Space, it’s all ready to go for you. I love them so much. (Keep reading for full instructions.) I also made the felt banner using the rotary blade! 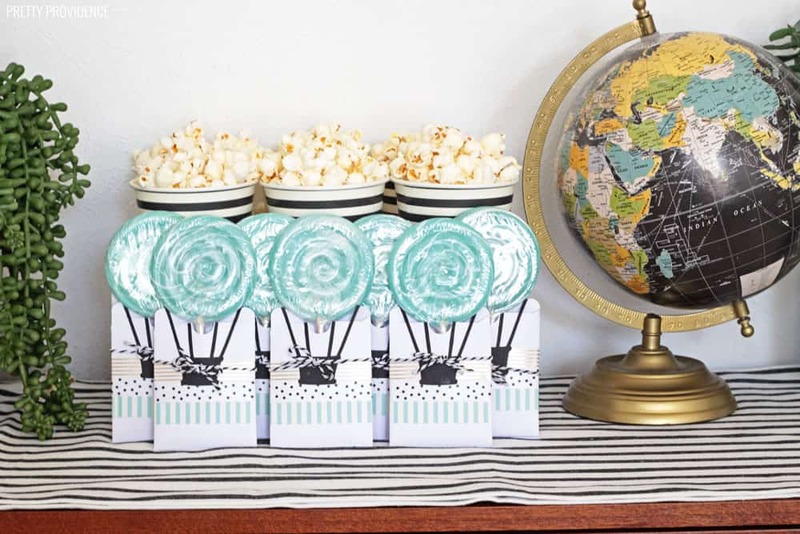 Then the last thing I made were the baby shower favors – hot air balloon lollipops. Obsessed is an understatement. I feel like hot air balloons and travel sort of go hand-in-hand so I thought the globe would be a good touch for a table decoration. 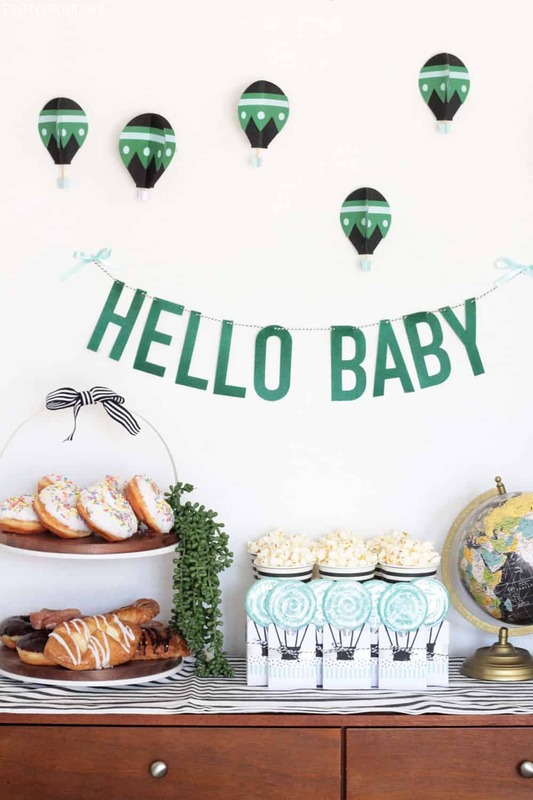 These would be a nice touch for a travel themed baby shower, or a ‘hello world’ shower, it all works! For party food, I always try to find cheap ways to feed a crowd. Donuts! 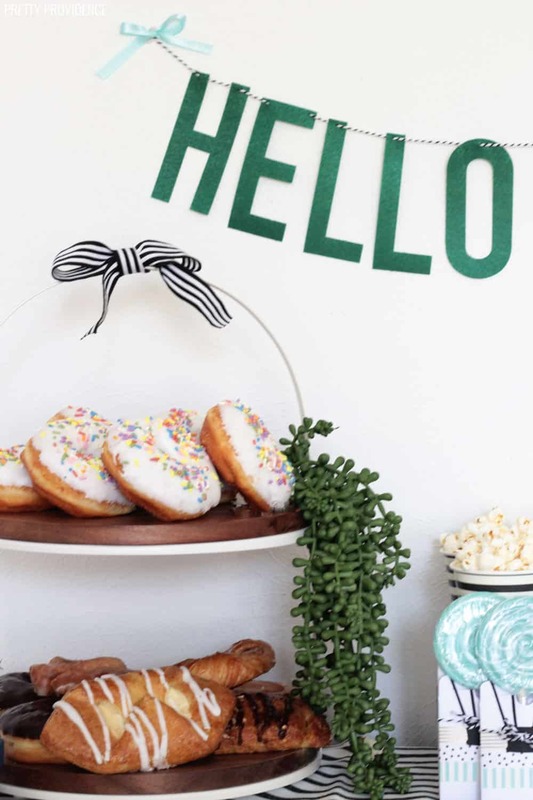 Everyone likes donuts, they look amazing on a party table, and they are super inexpensive. I also love popcorn for the same reason. Have you seen this popcorn topping bar idea? It’s a good one. 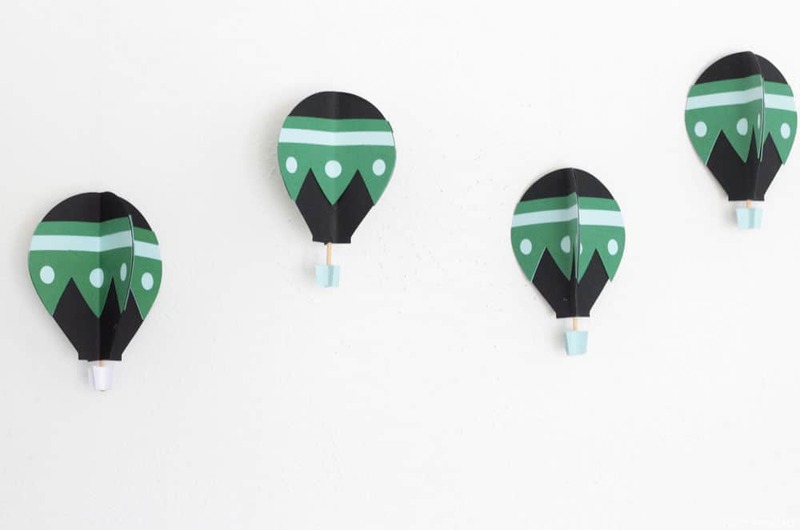 As I mentioned, these 3D Hot Air Balloons are a Cricut Design Space project. When you open the project, the basic instructions are there. I am sharing the details, plus some further tips after some trial and error. 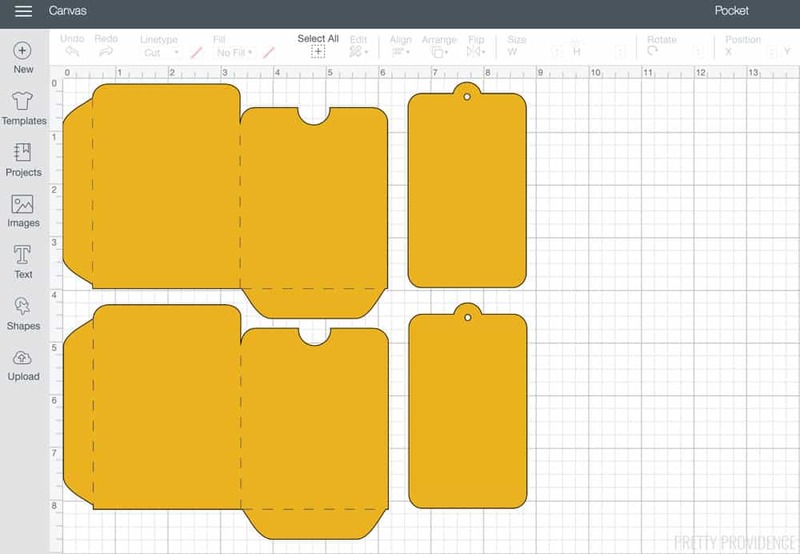 One thing that the tutorial in Design Space doesn’t specify, is that you will need a Scoring Wheel (only for the Cricut Maker) or a scoring stylus to score the paper in the right place. I also recommend using a LightGrip mat instead of a Standard Grip. It’s easier on the card stock. 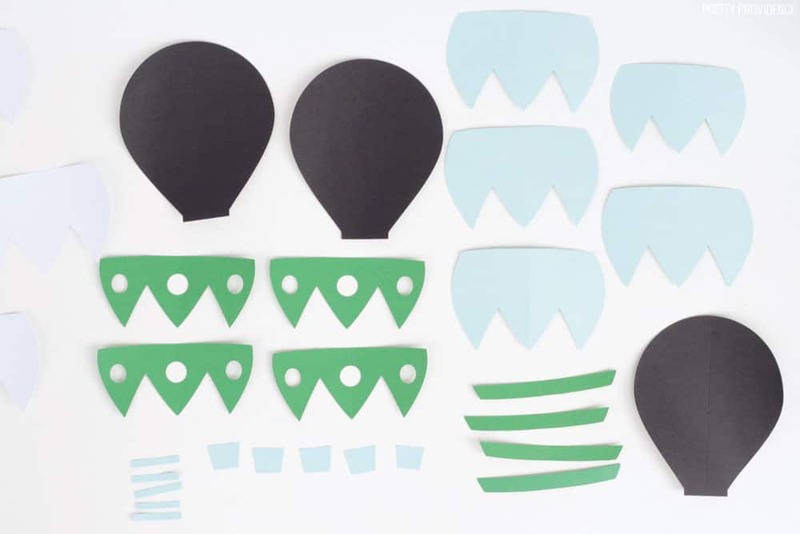 Assemble and glue each side of the hot air balloons. This takes a while so I recommend setting aside a couple hours and turning on a show or listening to audiobooks while you do it! Fold the hot air balloons on the scoring line. Glue sides of balloons together. I did three sides for each balloon, but the project actually calls for five sides. tie string onto wood skewer and place it in the middle of the hot air balloon (with the string coming out of the top) before you glue the last sides together. Instead of hanging mine from a tree branch, I used command hooks. I do plan to make them into a mobile to give to a friend, though! 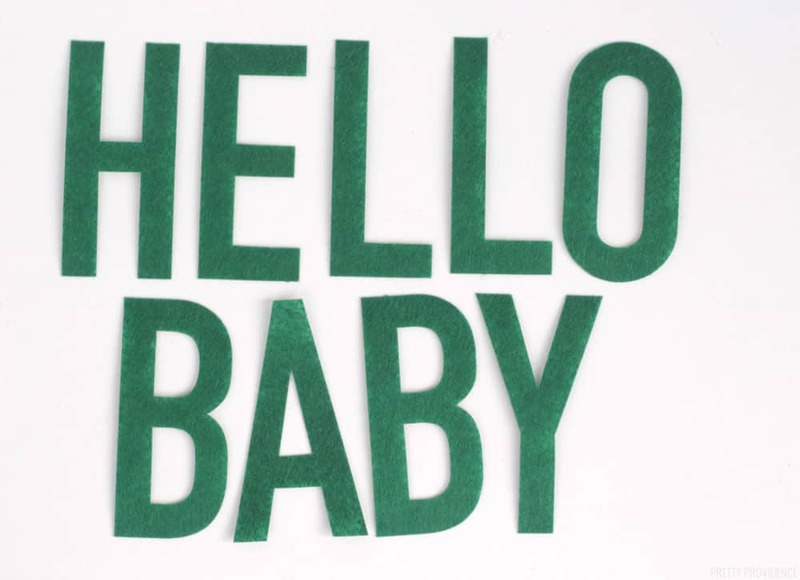 I cut the ‘Hello Baby’ banner out of green felt using my Rotary Blade and FabricGrip mat. You can use this design by opening it in design space. I am always impressed at how clean the rotary blade can cut fabrics and felt. I mean, look at these edges. After cutting the letters out, I threaded baker’s twine through the tops of the letters. Easy peasy! 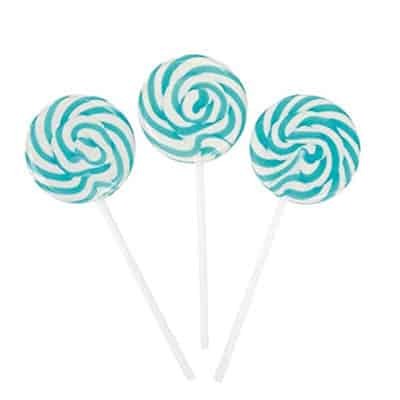 I found blue lollipops (similar to these) at the party store, and immediately had a VISION. I am so glad I figured out how to make them look like hot air balloons. It is really simple, you make paper pouches and glue a balloon basket onto it. Washi tape and baker’s twine were added for extra detail. I just love how they turned out. For this project, I used the Scoring Wheel in the Cricut Maker. The pocket is #ME0EF1C in Design Space. Quick note: The pocket image has a tag attached to it too. I just cut those too and plan to use them for gifts as needed. The hot air balloon basket is actually a full hot air balloon image that I cut the balloon off of. It works, haha! That image is actually a set, too, but for this I just used the bigger one, making it about 3 inches wide. 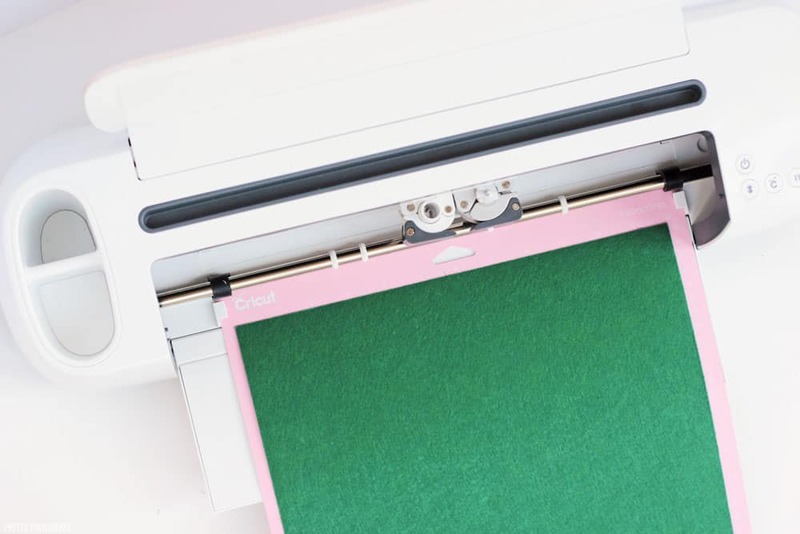 Load card stock onto a LightGrip mat and cut envelopes. Fold envelope on scoring lines and glue it with tacky glue. 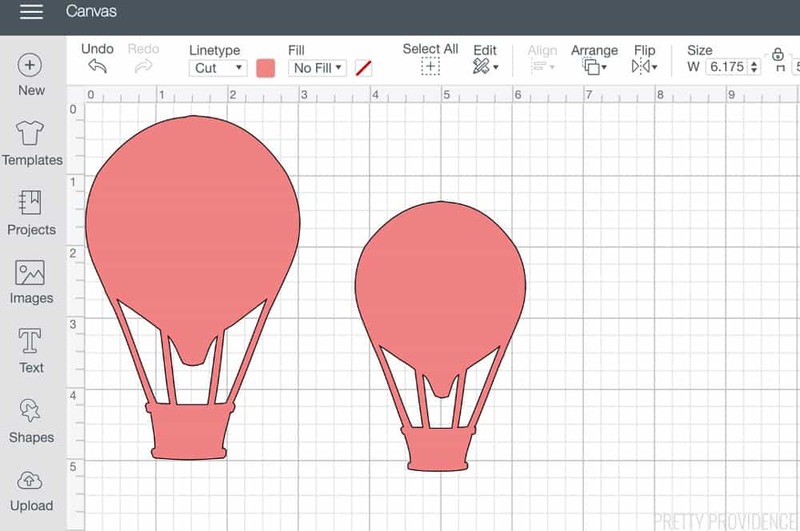 Next, cut the hot air balloon image – it’s #M7931A5A in Design Space. Make the balloon diameter about the same size as your lollipop. Mine was 3 inches. Cut the balloon part off of the basket, and glue the basket to the envelope. 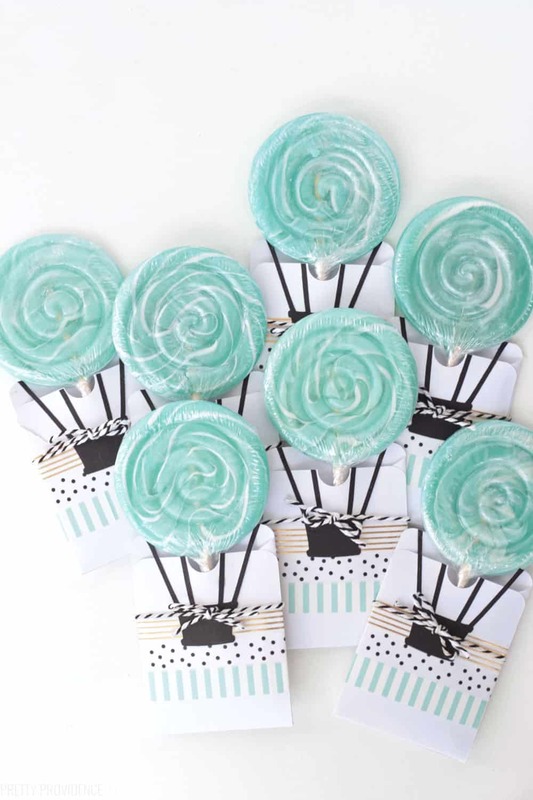 Slip the lollipop into the envelope, and add baker’s twine around to finish it off! So easy, and I don’t think I have ever seen a cuter baby shower favor! Don’t miss our baby shower gift ideas either! I hope this inspires you for the next baby shower you get to host! 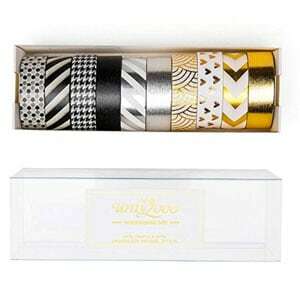 Absolutely stunning – so whimsical and fun! This is such a fun and unique baby shower idea! Thank you! We loved it! What a beautiful theme for a baby shower! Love the colors! This is really awesome! I really love this idea! Thanks Toni! We loved it! This is such a neat idea! I would haha never thought of this but it is awesome. Thank you!! We loved it!